Can you believe a little boy's claim that he was murdered in his previous life? There are more than 2,500 documented cases of young children who have reported past-life memories. Now, homicide Lieutenant Hank Donaghue and Detective Karen Stainer are pulled into the Martin Liu cold case when a little boy begins to talk about the men who shot him “when he was Martin.” Experienced criminal investigators, they find it hard to believe the three-year-old’s claims but the boy’s uncle, Triad enforcer Peter Mah, has no such qualms. Following the boy's clues he tracks down the killers one by one and exacts his revenge. Now Donaghue and Stainer must race to contain the violence sweeping their city while struggling to accept the incredible statements of an innocent little boy! The first Donaghue and Stainer Crime Novel. 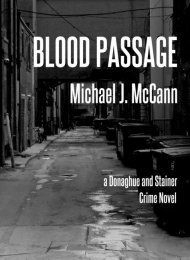 Ask your local independent bookstore to order BLOOD PASSAGE in paperback for you. It's available world-wide through the Ingram catalog.